Certainly, something to consider as lawns begin to green up and dead areas start to stand out. 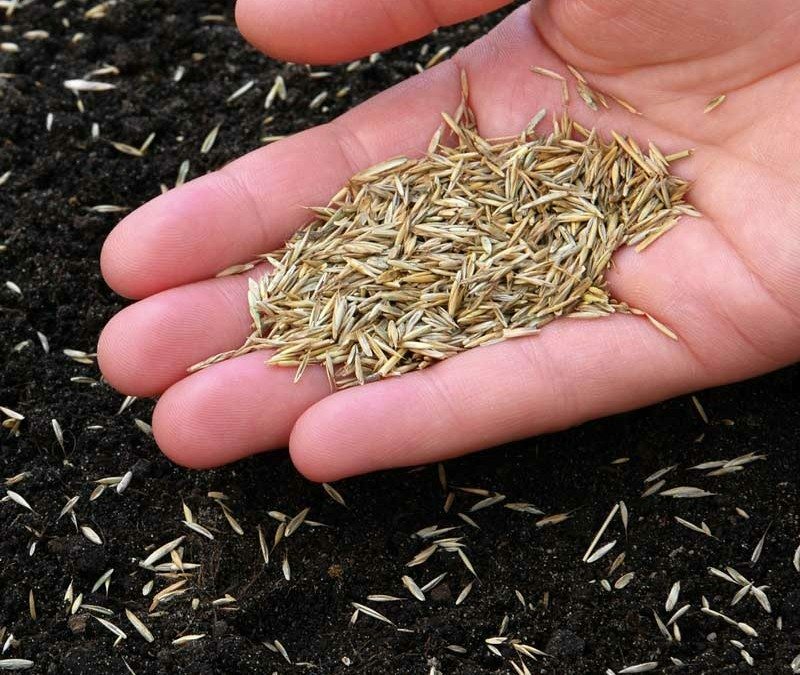 If you are considering some patch seeding in your lawn there are a few things you should know before you run out and start throwing seed down. Select the right type of seed. All grass seed should have a “sell by” date. Make sure you use this seed before that date! Many big box stores and hardware stores may not even know that seed expires. It does! Check the freshness and if you have extra seed that you need to get rid of, throw it down on some bare areas. Loosen the soil before spreading seed. Grass seed will not germinate if it cannot contact the soil. You need to have good seed to soil contact. A steel rake works wonders for small jobs. Scratch in a few different directions to loosen the top 1/2″ – 1″ of topsoil and spread your seed. Not too light… Make it count. About 1 seed every 5 – 10 millimeters is great! Consider buying a bag of lawn soil at the store as well. Adding 1/2″ or good rich dark topsoil will be a great addition to get that seed going with muscle. Force it into the soil! After loosening the soil, spreading any topsoil and seed, you need to take one more step to ensure the seed has a fighting chance. Use your feet to walk over the entire area stepping the seed into the soil. This will help the seed have something to root right into. If you leave it sitting on top of soil particles it will have a hard time rooting on a mountaintop! Step the seed into the ground. Not too hard, just use your body weight and step it in. If you have a larger area using a roller if you have one. Fill it half full with water and roll it around to have the same effect. Water water water! 3 times per day! 2 – 3 times per day lightly sprinkle the seed to keep it moist all day long. Mimic natural rainfall. You only need to do this for the first 2 – 3 weeks until the seed germinates. Once you see about 1/2″ of growth you can back off to once per day. In the springtime when temperatures are cooler it will take longer for the seed to germinate. However, the earlier you start the better chance you have of the root systems developing deep enough to make it through the summer. However, you must keep your eyes on your new grass during the summer months. If it gets really hot and dry you really should water the grass. Deeply and thoroughly after it has been mowed twice. Only once or twice per week. How long you ask? Water for at least an hour so you can saturate the soil. DO NOT do it every day. You will promote fungus and could lose everything. Water early in the morning, not midday and not in the evening. Deeply, thoroughly and INFREQUENTLY! When to mow and how. Mow your grass at the height of 2.5″ – 3″ finish cut. That means if your grass grows to 4″ – 4.5″ make your cut down to 2.5″ – 3″. Never remove more than 1/3 of the leaf blade per cut. Mow frequently so you don’t cause clumping and PLEASE USE SHARP MOWER BLADES! Don’t use a ride on tractor! You will hurt your delicate seedlings if you use a heavy ride on mowers. Please do your best to use a push mower for the first 4 cuts. After that, you can test a ride on. The longer you wait the better chance you have of giving your seedlings a fighting chance. Once you have had a chance to step back and marvel at your success, make sure you have a lawn care program ready to go! A fertility program to promote healthy growth and thickening is key for a successful lawn season. Don’t cut corners when you are deciding on a lawn care program. It’s important that you feed your grass so it can thicken. Your newly seeded areas may be thin, to begin with, but with fertility, you will help it fill in. Don’t forget to apply a grub control! You will need to do this after your seed germinates so you can keep the new grass protected as well. Also, don’t forget that grub control needs to be applied before the first couple weeks in June! With a little education and planning ahead you can patch seed your lawn yourself. Make sure you follow the guidelines above and by all means if you have any questions feel free to give us a call! 207-989-1433.